1. For the sauce: In small bowl, mix together tomato, onions, parsley, olive oil, vinegar, garlic, oregano, low-sodium adobo and crushed red pepper; cover and refrigerate for at least 1 hour, or up to 48 hours. 2. Heat grill to medium-high heat. Sprinkle steak on both sides with low-sodium adobo seasoning. Place steak on hot, greased grill grates. Cook, flipping once, until steak is well browned on both sides and cooked to 145 ˚F (about 6 minutes for medium-rare). Let rest for 5 minutes. Thinly slice steak. 3. Divide steak evenly among serving plates. Top with reserved Salsa Criolla. Nutrition Facts: Calories, 220; Calories from fat, 100; Total fat, 11g; Saturated fat, 3.5g; Trans fat 0g; Cholesterol, 70mg; Sodium, 80mg; Total Carbohydrate, 5g; Fiber, 1g; Protein, 25g; Vit. A, 8%; Vit. C, 15%; Calcium, 2%; Iron, 15%. 1. Beat the egg, then add the oil and beat again. 2. Add other ingredients and stir. * Adjust the quantity or eliminate salt to meet individual health needs and taste. 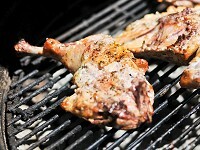 Barbecued chicken basted frequently during cooling will be saltier than chicken that has been lightly basted. 1. Place the broiler halves over the fire after the flame is gone. Turn the halves every five to ten minutes, depending on the heat from the fire. Use turners or a long handled fork. The chicken should be basted with a fiber brush at each turning. The basting should be light at first and heavy near the end of the cooling period. 2. Cooking time is about one hour, depending on the amount of the heat and on the size of the broiler. Test the chicken to see whether it is done by pulling the wing away from the body. If the meat is this area splits easily and there is no red color in the joint, the chicken is done. 1. Place vinaigrette ingredients in a small bowl and whisk; set aside. 2. Cut vegetables as directed. 3. Heat grill and grilling tray. 4. 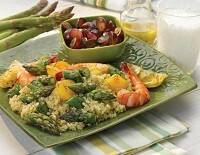 Place vegetables and shrimp in a large bowl; add about 1/3 of the vinaigrette (about 3 tbsp) and toss. 5. Spread shrimp-vegetable mixture over hot grilling tray. 6. Grill, turning shrimp and vegetables, until the flesh of the shrimp is an opaque color (about 5-6 minutes); remove from grill. 7. Serve grill mixture over cooked quinoa, and drizzle with vinaigrette. Nutrition Facts: Calories, 460; Calories from fat, 140; Total fat, 16g; Saturated fat, 2g; Trans fat 0g; Cholesterol, 115mg; Sodium, 420mg; Total Carbohydrate, 51g; Fiber, 7g; Protein, 29g; Vit. A, 15%; Vit. C, 90%; Calcium, 10%; Iron, 35%. 1. Heat grill. Peel and cut avocado into chunks; place in a medium bowl. 2. Mix lemon juice, basil, and ½ tsp black pepper. Drizzle over avocado chunks, toss, and set aside. 3. Cut chicken breasts in half crosswise. Mix ½ tablespoon olive oil, salt, and remaining black pepper. Brush mixture on chicken and red bell pepper. Grill chicken and pepper until done. Set chicken breasts aside. Cut pepper into thin strips. 4. While chicken and peppers are grilling, heat remaining olive oil in a large pan, add garlic and onion, and cook until tender, about 5 minutes. Add water, bouillon, and quinoa to pan; bring to boil, cover, reduce heat, and simmer until liquid is absorbed and quinoa is cooked (about 15-20 minutes). 5. Place quinoa pilaf in a large bowl and add chicken, red peppers, and avocado. Toss gently. Nutrition Facts: Calories, 460; Calories from fat, 140; Total fat, 16g; Saturated fat, 2g; Trans fat 0g; Cholesterol, 45mg; Sodium, 240mg; Total Carbohydrate, 54g; Fiber, 7g; Protein, 28g; Vit. A, 30%; Vit. C, 100%; Calcium, 6%; Iron, 30%. 1. Combine the oil, juice from one lime, oregano, and black pepper in a shallow glass baking dish. Stir. Place the chicken breasts in the baking dish and turn to coat each side. Cover the dish and refrigerate overnight. Turn the chicken periodically to marinate chicken on both sides. 2. Put water, tomatillos, and onion into a saucepan. Bring to a gentle boil and cook, uncovered, for 10 minutes or until the tomatillos are tender. In a blender, place the cooked onion, tomatillos, and any remaining water. Add the garlic, peppers, cilantro, salt, and the remaining lime juice. Blend until all ingredients are smooth. Place the sauce into a bowl and refrigerate. 3. Place the chicken breasts on a hot grill and cook until done. Place the chicken on a serving platter. 4. Spoon a tablespoon of low-fat sour cream over each chicken breast. Pour the sauce over the sour cream. 1. Place potatoes into bowl, add oil and toss. 2. Add remaining ingredients and toss. 4. Cook potatoes about 30-45 minutes. For quicker cooking, partially boil or microwave potatoes before grilling. * If using aluminum foil, bring longer sides of foil together over food. Fold down loosely in locked folds, allowing for heat circulation and expansion. Fold up short ends; crimp to seal. If using an aluminum pan, cover the pan with aluminum foil. It is best if you do not cook potatoes directly over the flame. 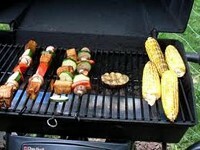 Charcoal grills-move charcoal to one side of grill and place potatoes away from coals. Gas grill (multiple burners)-turn off one of the burners and place potatoes over unlit burner. Close grill cover while cooking. In a small bowl, whisk olive oil, vinegar, grape or apple juice, salt, and herb blend. Boil water and cook pasta according to package instructions. Drain pasta, rinse in cool water. Heat grill, rub peppers with ½ tsp olive oil. Grill whole peppers, turning as needed, until skin begins to brown and bubble. At the same time, grill beef sirloin to 145 °F, turning once. Remove from grill, let cool slightly. Slice peppers into strips, discarding seeds and stem. Cut sirloin across the grain into thin slices. Slice pears into thin wedges. Toss arugula and pasta in large bowl. To serve, evenly divide pasta-arugula onto four plates, arrange beef, peppers, and pears on top, drizzle with vinaigrette, and sprinkle with crumbled Gorgonzola cheese. Nutrition Facts: Calories, 360; Calories from fat, 110; Total fat, 12g; Saturated fat, 4g; Trans fat 0g; Cholesterol, 65mg; Sodium, 330mg; Total Carbohydrate, 44g; Fiber, 7g; Protein, 27g; Vit. A, 40%; Vit. C, 250%; Calcium, 10%; Iron, 15%. 1. Preheat the grill for 20 minutes or until all coals are uniformly ashy gray in color. 2. Scrub the sweet potatoes under running water with a vegetable brush. 3. Cut into 1/ 2 -inch slices. Brush one side with the butter and sprinkle with thepepper. 4. Arrange brushed side down on a grill rack and repeat the process on the remaining side. 5. Grill for 20 minutes, turning and brushing with the remaining butter until the sweet potatoes are soft when pricked with a fork. Rinse vegetables and prepare for marinade. In a large plastic bag or plastic container combine vinegar, oil, garlic, basil, and thyme. Add vegetables and mix well to coat vegetables. Seal bag or container and refrigerate for 1 hour or overnight. Drain vegetables and save marinate. Vegetables can be grilled in a grilling basket, on skewers, or wrapped in foil. Keep vegetables about 4-6 inches from the heat source. Keep vegetables from extreme high temperatures. Add more marinate to vegetables as they cook. Cook about 5 minutes and turn vegetables. Cook 5 minutes longer or until the vegetables are tender. 1. About 15 minutes before cooking, measure the salsa into a large bowl. 2. Rinse and pat dry chicken pieces. Remove any remaining skin and fat. Place in the large bowl and turn with tongs to coat completely. Place bowl in refrigerator until ready to cook chicken. 3. Place on hot grill or broiler pan. Grill or broil about 5 minutes on each side depending on thickness. 4. Serve immediately or refrigerate to use in salads or sandwiches. In a bowl, combine the soy sauce, water, lemon juice, oil, brown sugar, garlic and ginger. Pour half into a large re-sealable bag or shallow glass container. Refrigerate the remaining marinade for basting. Add meat to marinade in bag or glass container. Cover and refrigerate 1-4 hours. On four metal or soaked bamboo skewers, alternate meat, zucchini and red pepper. Grill uncovered, over medium-hot heat for 3 minutes on each side. Continue basting and turning kabobs for 4-6 minutes or until meat juice runs clear. 1. Heat grill to Medium heat or 350 degrees. 2. Wash vegetables and slice. 3. Toss in a large bowl. Add dressing and toss until all vegetables are coated. 4. Tear 2 large squares of aluminum foil and place half of the vegetable mixture on each piece. Place an equal piece of foil over the top of vegetable mixture and fold bottom piece with top sheet to form a packet. 5. Place on heated grill for 20-30 minutes or until the potatoes are tender. If you don't have a grill bake Veggie Packets in the oven at 400 degrees for 20-30 minutes. 6. Before you open the packets, poke holes in the foil with a fork. Be very careful opening the foil as the steam will be very hot and could burn you! 7. Empty vegetables onto serving plate or serve from foil packets. 1. Try different vegetables- Tomatoes, green beans, sweet potatoes, mushrooms, broccoli, carrots, corn or your favorites. 2. Use herbs or spices in place of dressing - Chili powder, Italian or oriental seasoning, basil, oregano, curry powder - be creative! Nutrition Facts: Calories, 160; Total Fat, 5 g; Calories from Fat, 25; Cholesterol. 0 mg; Fiber, 4 g; Sodium, 170 mg; Carbohydrates, 31 g; Protein, 4 g; 40% vit. A; 110% vit. C; 4% calcium; 10% iron. 2. Whisk together dressing ingredients in a small bowl. 3. Cut tuna into 1” chunks and skewer and place on two-three 3” skewers; brush lightly with olive oil. Season lightly with salt and pepper. 4. Grill skewered tuna until fish is opaque and flakes with a fork (145 °F); remove from grill. 5. In a large bowl, toss dressing with all vegetable ingredients. 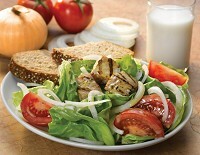 To serve, divide salad on four individual plates; top with tuna. Nutrition Facts: Calories, 160; Calories from fat, 60; Total fat, 6g; Saturated fat, 1g; Trans fat 0g; Cholesterol, 20mg; Sodium, 260mg; Total Carbohydrate, 11g; Fiber, 3g; Protein,16g; Vit. A, 30%; Vit. C, 35%; Calcium, 4%; Iron, 8%.